General Hospital (GH) spoilers tease that one former ABC soap star may want back on the show. According to a new Soap Opera Digest blind item, an Emmy-winning actor has contacted his old soap about the possibility of returning. This info could be about any of the four main daytime dramas, but GH certainly seems like a strong contender. There’s one actor that fans are always clamoring for and that’s Tyler Christopher (ex-Nikolas Cassadine). Many General Hospital viewers would love to see Nikolas get back in the action and shake things up. Christopher is still airing in the role of Stefan DiMera on Days of Our Lives, but that’s only because of DOOL’s advance filming schedule. He hasn’t been working there for quite some time. After Christopher took a mysterious leave of absence, Brandon Barash (ex-Johnny Zacchara on General Hospital) stepped up to fill his shoes. The replacement must’ve gone over well because Barash’s temporary gig became permanent. Barash is sticking around as Stefan on Days, so where does that leave Christopher? Out of a job and potentially eager to make a comeback in Port Charles. Christopher fits the criteria for this blind item as both a male and a Daytime Emmy winner. It’s actually the perfect time for Nikolas to return since GH has the ideal setup. They still haven’t revealed the story behind the mystery of the Cassadine hand. Someone wearing a Cassadine ring took Cassandra Pierce (Jessica Tuck), so Nik could easily be exposed as the one who swiped her. General Hospital spoilers say the question of who took Cassandra won’t be answered just yet. The show intends to hold off for a while, so maybe they came up with this idea as a flexible one. Since they simply showed a Cassadine ring, they have options when it comes to which one to bring back. Perhaps they’ve been mulling over the right Cassadine to use here. If Christopher is seeking a return, they could go with Nikolas. It would make sense considering Nik would want revenge on Valentin Cassadine (James Patrick Stuart), who’s closely connected to Cassandra. General Hospital watchers would love to see Nik and Valentin face off! 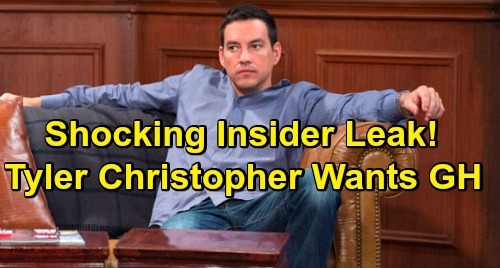 Do you think Tyler Christopher wants back on GH? If so, do you believe he’ll get his wish? Would you like to see Nikolas Cassadine on General Hospital again? We’ll give you updates as other news comes in. Stay tuned to the ABC soap and don’t forget to check CDL often for the latest General Hospital spoilers, updates and news.